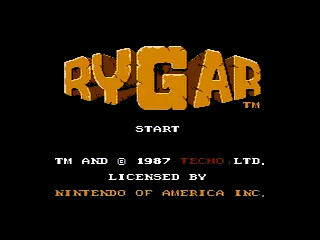 Released in July 1987, Rygar is the story of a warrior from Argus named Rygar, who has been brought back from the dead to defeat the evil Ligar, open the Door of Peace, and restore tranquility to Argool. The game was one of the first to bring RPG elements into a more action-oriented game, but is now probably best known for its awful translation and frisbee-like main weapon (which is actually a shield). Best time: 0:22:53 by 'Darkwing Duck' on 2014-03-12. Best time with deaths: 0:08:58 by 'ShiningDragoon' on 2015-07-03. Best time, European version: 0:28:38 by Kristian 'Arctic_Eagle' Emanuelsen on 2009-07-10. With deaths 0:08:58 by 'ShiningDragoon'. Heya this is ShiningDragoon here with Glitched Rygar Any%. Basically the point of this category it to beat the game as fast as humanly possible using all the strategies you can. Gran Mountain - I start off the run taking a damage boost from one of the Rolphers and head to the next screen. At this point we jump our way over the pit to reach the actual mountain and go up the first two rope ladders. We then take one more hit by a Phollorakos to reach 0 health and continue to the over world (Garloz). Garloz - At this point we need to grab at least two kills from the Hyoking that actually give experience, since not all Hyoking do on that screen. So we end up killing 2 of them on the first screen and on the second screen kill a Kinoble. At this point we continue to the guru shrine and grab the grapple item. After this point we quickly exit the room and kill ourselves to deathwarp to start and make our way to the first boss. Damage in this game works by your stat called Tone, you start at 30 tone and every 8 tone you gain more damage. Therefore you need to at least grab 2 tone to get you to 32 tone which is the next multiple of 8 in order to make farming go faster later. Valley of Rolsa/Forest of Eruga – Overall there isn't much to say about this area, other than this is the first time we use the grapple item which becomes more important later on in the game. In the second screen when we hit the forest I actually make a small mistake and take some damage from the Kinatarnos spine attack but the damage boost makes up for any lost time. After which we head to the first boss Eruga. Eruga – Using this strategy we need to wait for the 10th attack to push us "Safely" through the boundaries of the wall, the glitched area to the right corresponds to the second to last bosses area so when the game over occurs the game believes you are fighting Belzar in Lapis. Lapis – We cannot beat Belzar or the final boss Ligar at this point in time so now we need to farm enemies. While the robot enemies called Bargan give more experience one cannot farm them very efficiently due to the limited number of them that fall from the sky. Instead we keep moving right to farm the rolling Ammolums. Each Ammolum gives about 7 tone compared to the 17 or so from the Bargans. However one can quickly spawn these enemies and have up to 4 of them on the screen at a time. We first get 3 mind points to let us use power up to increase the range (and supposedly strength) of our disk armor attack and then keep farming till we reach 9 total health bars. We then heal ourselves up quickly and keep farming until we can one shot the Ammolums, we then kill 10 more of them and head towards Belzar killing everything we can along the way. Belzar – Simple enough, use grapple to get up to the bosses level and attack until dead. However then we need to do the hover glitch. First we need to use our grappling hook to get some extra height and immediately hold down on the dpad to lock us at that height. We then quickly alternate right and down to slowly move over on the screen till our foot reaches the pillars and jump through an opening in the wall to get to Ligar. Ligar – We start off using the last of our mind points to cast attack and assail, an ability that hits everything on screen as well as giving invincibility frames. After expending our 10 charges we grapple down and smack Ligar in the face till we reach the victory screen. European Version: 0:28:38 by Kristian Emanuelsen. When it comes to the first part of the run up until the first boss, it's useful to collect as many Tone-points as possible from killing enemies, without wasting much time. The first boss Eruga requires less hits to kill relative to your Tone-point value, and the hits take some time to place. Perhaps I gather a bit too many Tone-points before the Eruga-fight, but it's difficult to calculate the perfect time used killing enemies vs hits to kill Eruga. The Eruga fight went very well. It's not possible to hit Erugia 4 times per Erugia-shot as in the american version. On the european/PAL version maximum hits are 3 then 2 then 3 then 2 and so on, regardless of buttonmashing skills. Primeval Mountains: I stop and go back for a Three Star Drop, which costs me a few seconds. I should have counted enemies on the way, to be aware of the drop, but didn't. However, those Three Star drops are really useful, as I'll ideally want to collect an amount of 17 mind-points on my way to the final part of the Sky Castle: 3 mind-points to Power Up my weapon before Dorago's Palace, 7 mind-points for a Recover in Dorago's Palace to skip the healingroom after The Tower of Garba, and 7 mind-points in reserve when I reach the end of the Sky Castle. As I kill less enemies in the european run than the american one, the amount isn't always possible to collect, as luck is involved in Three Star drops. For every 10 enemies killed you get a drop, which is either a One Star, a Three Star or a Life Potion. I believe it's a 1/3 chance for each of them. Dorago's Palace, Tower of Garba, Lapis and path to Sky Castle all went fairly well, with no major problems. The Garba fight is a bit cautious, but as you'll see, one hit from him drains three life-points in this Rygar version with my Last-level. End of the Sky Castle: Thanks to ktwo's brainpower, I initialize his strategy in this section to make the Ligar fight easier and faster to deal with. I try to summon a Triple Star drop here as quickly as possible, so that I can then use 5 of my 7 Mind-points for an Attack & Assail that I can cover over to the Ligar fight. And then take the dropped Triple Star to give me another 5 Mind-points to use on an Attack & Assail in the Ligar fight later, when my 9 Attack & Assail hits has run out. How quicly you can get the Triple Star drop is purely luck-driven, a 1/3 chance. Respawning the enemies here from screen-scrolling are maximum three enemies on the screen at once, unlike in Dorago's Palace. I get the Triple Star on my second drop there, not perfect, but rather good. What's not good is that I accidentally waste 2 of 9 Attack & Assail hits when trying to pulley over to "Ligar's House". Nevertheless, I manage to kill Ligar. Ligar-fight: Could have been a few seconds faster, but it's a difficult boss-fight. I enter the menu-screen once for no reason and the final hit could have been thrown earlier, but I lost count of the hits (33? needed). I'm really in the zone in the fight for a moment there though when placing lots of hits without getting hit myself. Marc J. 'Emptyeye' Dziezynski for his Rygar run at SDA which I learned from and enjoyed.